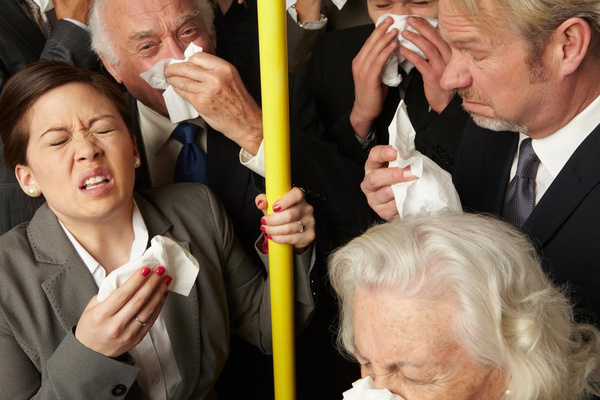 It’s the height of cold and flu season, and germs are absolutely everywhere. We all know that we should wash our hands thouroughly with soap and water and avoid touching our faces as a precaution. We also know the subway pole at rush hour is probably more germ ridden than a public toilet seat, but sometimes we have to touch it anyways. But what else do we touch that could potentially be a cesspool of germs? When was the last time you wiped down both sides of your cell phone, and your earbuds? Do you wipe the light switches and door knobs in your home? How about the refrigerator door handle? Do you ever clean the remote control, or the railings of your staircase? Your key- board and mouse? A no brainer. Warm, moist environments are breeding grounds for germs. Run your washing machine through a cycle with a couple of tablespoons of white vinegar and hot water to clean the machine itself. You can do the same with the dishwasher. Walk into the gym at the begining of a class, and everything seems clean and fresh. Check it out at the end of the class when the weights, bikes and mats are covered with sweat. Arrive a little early and wipe down your equipment before using it. Trust me, it’s gross. Many viruses are airborne. If someone is coughing or sneezing near you, try to hold your breath for at least 10 or 15 seconds and turn away, to avoid breathing in the recently released germs. Much of our immunity is in our stomachs. Your gut has a barrier of healthy bacteria that can prevent the absorbtion of pathogens. Probiotics can enhance this barrier. In addition to taking a probiotic suppliment, you can eat more fermented foods, drink kumbucha, or eat plain yogurt. Of course the stronger your immune system is, the healthier you will stay. In addition to employing Howard Hughes like tactics to avoid germs, it’s important to maintain good health by eating well, staying hydrated, getting exercise and sufficient sleep. This entry was posted on February 5, 2015 at 6:56 am and is filed under fitness. You can follow any responses to this entry through the RSS 2.0 feed. You can leave a response, or trackback from your own site. Really useful post! I will be even more careful now! Thanks! Greets, Millwall Carpet Cleaners Ltd.